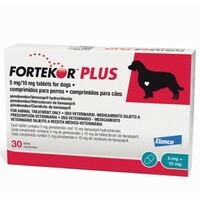 Fortekor Plus 5/10mg for Dogs is for the treatment of congestive heart failure due to atrioventricular valve insufficiency or dilated cardiomyopathy in dogs weighing over 10kg. Each tablet contains Pimobendan 5mg and Benazepril Hydrochloride 10mg, and can be easily divided along the score line into two equal halves for accurate dosing. Fortekor Plus is a fixed combination product which should only be used in dogs which require both active substances to be administered concomitantly at this fixed dose.